David Cameron has said his government was unable to solve the "huge" challenge of funding social care for the UK's ageing population. 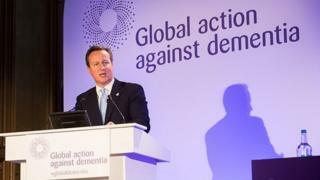 Mr Cameron told the Financial Times that a way now had to be found to meet "catastrophic" dementia care costs. "We didn't solve that problem," the former prime minister, now president of Alzheimer's Research UK, said. While in office, he pledged to set a cap on lifetime care costs at £72,000, starting from age 65, by 2020. But Theresa May has since said the level of a potential cap would be subject to consultation. Mr Cameron, who was appointed to Alzheimer's Research UK in January, resigned as prime minister in 2016 after the Brexit vote result and stepped down as an MP later last year. His plans were put on hold in July 2015 after insurers proved reluctant to introduce policies so that people could insure against their care costs, up to a £72,000 limit. "The disappointment I had was I was hoping that a combination of the cap on care costs would help to deliver an insurer's model, where a market would grow up where everyone could insure themselves against the cost of long-term care," he said. "We just haven't cracked that yet." Mr Cameron described dementia as a "world of darkness" - and recalled visiting people in care homes in his Oxfordshire constituency while still an MP. "They were completely disconnected from their surroundings, their relatives, their friends and their lives," he said.